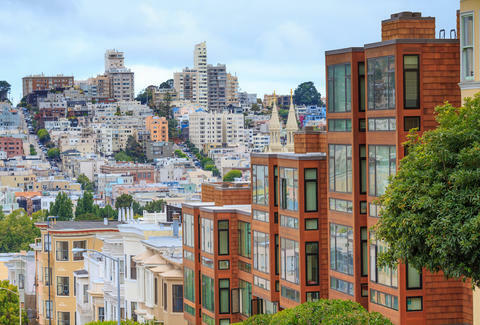 It's true: living in SF is ridiculously expensive. But that also means renting in SF can be incredibly lucrative. As in, you can get almost $500 a night for a one-bedroom on Airbnb if 1) you’re allowed to list it (please don’t tempt the landlord gods and lose your rent-controlled apartment), and 2) you know when to list it... which we totally do (!!!) since we hit up the data geniuses at BeyondPricing -- a company that provides dynamic pricing information to Airbnb listers. They crunched the numbers for us and came up with nine San Francisco events that rake in the most money for hosts, plus an estimate of how much you can expect to make with a one-bedroom. Couple key takeaways: mark every tech conference on your calendar and own a luxury yacht, if possible. Which SF Neighborhood Should You Move To? 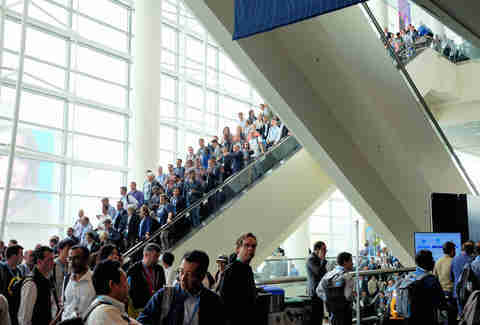 Essentially the Super Bowl of tech conferences, the Salesforce-palooza brought in more than 150,000 people to the 7x7 in 2015, congesting local hotels so much that the company docked a cruise ship in the Bay in order to add 1,100 more rooms. But even the “tech Dreamboat” (shudder) couldn’t house all the disruptors and change-makers in need of a crash pad, allowing hosts to rake in serious cash -- sometimes as much as $4,500 a night if you were rolling with an elegant Pacific Heights four-bedroom or Market St penthouse. Good news for us plebeians, too though: according to BeyondPricing, studios far from the venue garnered approximately 300% more than their regular listing price in October. The bad news: the conference juuuuust passed, which you know because you’re likely still recovering (whether you attended or not). The good news: you have just under a year to assemble that Ikea bookshelf. 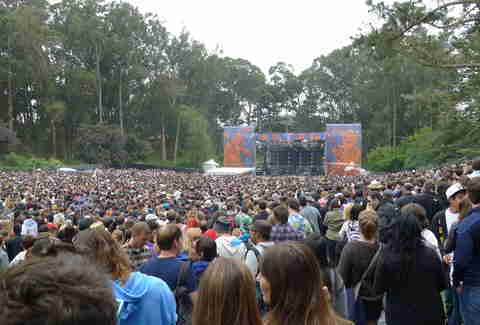 If 150,000 Dreamers congesting SoMa streets didn’t terrify you enough, consider that Golden Gate Park sees an estimated 180,000 festival-goers for Outside Lands every August. That’s a whole lotta crop-tops, yo! If an 180,000-deep party in the woods sounds like your nightmare, get out of town and earn in a night what everyone else spent on tickets -- no midriff baring required. This past year, a record number -- officials estimated more than a million!! 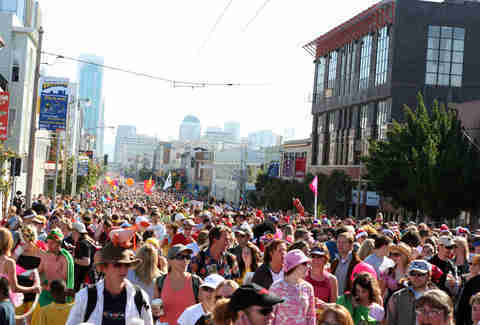 -- of spectators flooded the city streets in celebration of love and equality. It’s a world-famous weekend filled with parades and parties and enough good vibes to last all year. Of course, good vibes don’t pay the rent -- and if you live in Castro, Hayes Valley, or the Mission, a weekend spent camping or visiting friends would go a long way at least for one month. If you’re a software developer or an Apple product super-fan, Apple’s WORLDWIDE Developer Conference, where they showcase new software and technology, is probably your yearly pilgrimage. But if you’re neither of those things, we suggest skipping town, especially if you live near SoMa, Embarcadero, or the Financial District because 1) listings there earned the most, and 2) it’s going to give you lanyard PTSD if you stay. And hey, a couple nights in a tent this weekend could put you several hundred dollars closer to actually buying whatever technology Apple unveiled while you were away. 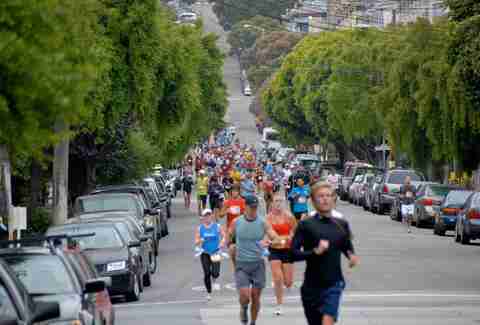 The San Francisco Marathon attracts more than 25,000 athletes from around the globe, making it the perfect time to leave if you’re the kind of person who’d rather make some easy money than run at 6am on a Saturday morning. (Um, good for you if you’re NOT that kind of person.) Those who live near the marathon’s starting line (SoMa, Embarcadero, and the FiDi) should especially do some soul searching as residents in those 'hoods made the most. We’re seeing a trend here: basically anytime developers come into town is your cue to get out, especially if you live near the city’s main business areas. The same is true for Google’s two-day developer conference, which is just enough time to hit up a near-SF getaway or embark on an epic West Coast road trip. We had to Google what the RSA Conference is, and honestly still don’t have a strong grasp on what exactly goes on during this week of industry events about the future of information security, but it’s definitely super important. You can do your part by letting one of those pros do the serious thinking in your overpriced apartment. The J.P. Morgan Healthcare Conference is the “biggest healthcare investing event of the year,” but unless you’re a healthcare investor, you don’t have to go. We hear Hawaii is great this time of year! Like the other conferences on the list, neighborhoods near the city’s major conference centers get the most requests. While you’d make a lot of memories at this costumed race/parade/city-wide party that’s attracted sprightly revelers in various stages of undress since 1912, you certainly won’t make $600 by applying body paint and running from the bay to the ocean… at least not in any way you’d want to tell your grandmother about. Amy Copperman is a regular contributor to Thrillist. She’s considering urban camping to make some quick cash. Consider joining her on Twitter @acoppergirl.